Call ’em blimps. Call ’em zeppelins. Call ’em dirigibles (if you can pronounce it). Call ’em airships. Whatever, if they are are solar and zero emissions and can carry cargo, we need ’em! Carbon emissions from cargo planes, ships, trains, and trucks is significant. 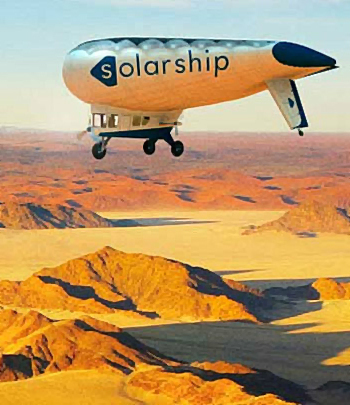 That a solar blimp can look really cool — always a plus for me — is yummy icing on the cake, but the fact that, according to Inhabitat, the makers of the SolarShip plan to demonstrate their vessels soon, in 2012 and 2013, is really exciting. [SolarShip]…has taken the steps to bring its vision of a green shipping future to life, recently completing the initial test flights for its solar helium plane. The prototype blends the concepts of blimp and airplane by placing a blimp lined with solar panels over an airplane cockpit and landing gear, and using solar power to propel the plane into the air. SolarShip plans to build three sizes of this ship: the small Caracal, the mid-size Chui, and the 30-tonne cargo hauler Nanuq. Now, sadly, these things won’t be replacing cargo ships and trains anytime soon. The largest of the three, after all, the 30-ton Nanuq, can only carry the equivalent of one 20-foot shipping container. But it’s a step in the right direction, and in the meantime we get some great CGI eye candy to watch.